or click PLAY button below to watch in this post. I’m finishing up my week of surgery with Dr. Umar this week. Those who have followed my case know that I’m a victim of the old-punch grafts. In the early 90’s (starting when I was only 19yrs old) I had a doctor from New England butcher my scalp and left me with scars, an unsightly appearance, and hardly any growth. I had to wear a hairpiece to go out in public. I’m 36 now, and still wear the hairpiece. My first couple of procedures with Dr. Umar were to create temple points and a temple region, of which I had none. Also, Dr. Umar placed leg hair (some chest hair too) into my ravaged rear scalp (where the old punch grafts were taken). The results were excellent. My temple region and points grew in to my utmost satisfaction and my rear scalp was improved–more of a filler to help camoflauge the large gaps. For this weeks procedure, Dr. Umar took things further. 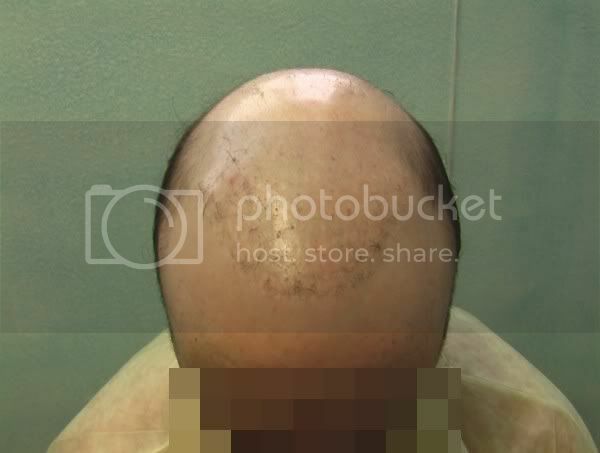 For my rear scalp area he placed beard hair throughout, so that the results will not act merely as a filler, but provide good density, both actual and cosmetic. Also, Dr. Umar created a hairline that will synch perfectly with his previously created temple region. This hairline was designed with my wish to continue to wear the hairpiece behind it. 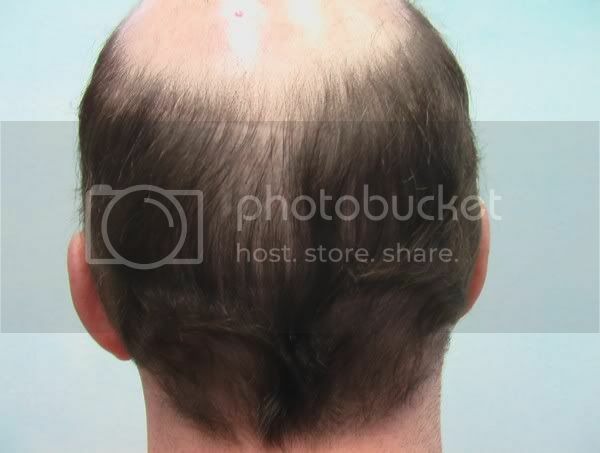 With the temple points, this hairline will blend and match my temple region perfectly. 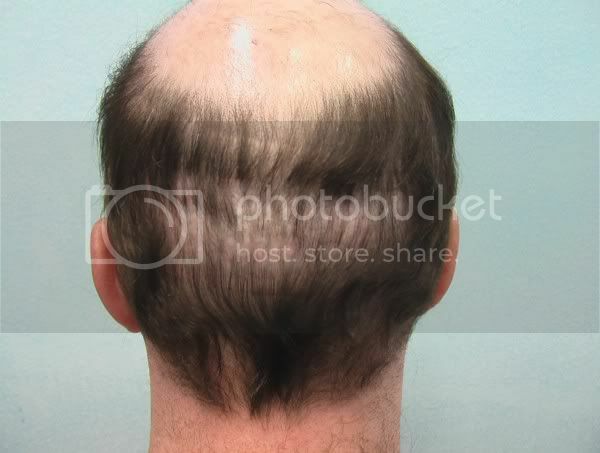 The decision to design a hairline with the intent of maintaining a hairpiece behind it is not to be taken lightly. Dr. Umar agreed to this strategy as he and I both know that I have no desire to get rid of the piece–unless a scientific breakthrough occurs (hair cloning) or I continue further with body/beard hair to make my bald zone diminish in size. The natural hairline in front of the piece will give me much more confidence, as I will no longer have to worry about how the “fake hairpiece hairline” looks–the front of any hairpiece is the biggest give-away to the obsever. Now I won’t have to worry about that anymore. Also, the maintence needed to wear a hairpiece behind my new “real” hairline will make my life much easier–though I’m sure it will take some time to get it right through some trial and error (blending, direction, styling, etc.)." Nice work. Nice honest video portraying the results. 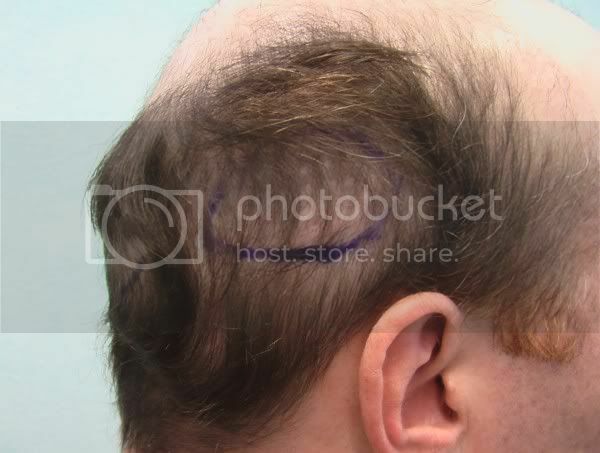 The hairpiece looks great incorporated with the new hairline, temples, and scar repair in the back. You can’t even tell it’s a hair piece if you didn’t know it. I’m sure this man is elated. Dr. Umar, someone in the hair multiplication forum said he spoke with mr. mannign recently and Mr. Mannign said a doctor recently coated beard hair grafts in ACELL then transplanted on the head. He said the grafts with ACELL grew while the other died and did not grow. Do you think if this is worth a try using Acell? Perhaps Acell can boost the yield for body hair? So this is how many grafts of BHT? It’s not clear, why is everybody so evasive with the # of grafts? I like the creative and wise approach this patient took. Given his extensive loss and comfort wearing a piece, re-creating a hairline to minimize the roving eyes to an unnatural hairpiece transition will give him some peace. The final product with the piece in place looks natural. Well done. Temple and donor area look very much improved, I’m particularly impressed by the donor repair. 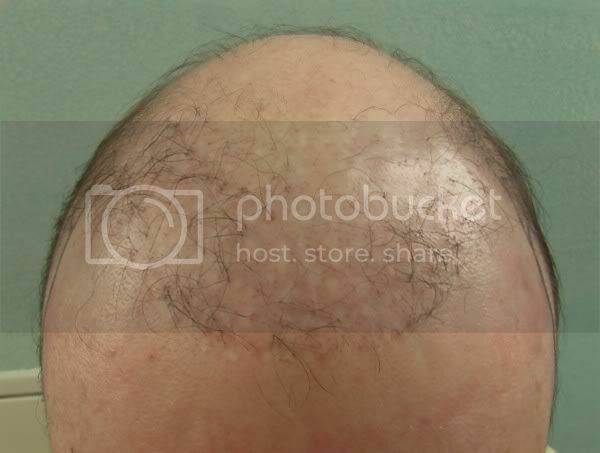 I think that the old punch plug style holes in the back of someones head are much more apparent to the eye than traditional strip scars and the density increase in this area is quite remarkable as beard seems to work really well. Hairline with hairpiece looks really good. » evasive with the # of grafts? I understand your frustration. I have put a permanent reminder at the top of the forum. I “think” it is approximately 8000 grafts in total. » beard seems to work really well. Hairline with hairpiece looks really good. Me too, very impressed with the donor repair, did Dr. Umar say how many beard grafts were used in the donor? I don’t think he mentioned in the vid. Beard hair it is, seems like it is the most consistent so far for repairing donor scars. The design is very specific to his needs, it certainly works very well for him right now. My only concern is what if one day he decides he no longer wants the hair piece, there is no room for plan B, he is stuck with this design. Consider that you might be right in assuming one day he no longer wants to use a hairpiece, but that could mean a repair session to cover up the work that was done to him (a teenager!) many years ago. He probably only is comfortable with either wearing a hairpiece, or attempting a repair. Shaving ones head for alot of people isnt an option. I doubt very seriously that he intends on doing anything else in the future other than wearing the hairpiece. For him he probabaly realizes this is his best option. » future other than wearing the hairpiece. » For him he probabaly realizes this is his best option. » It looks pretty good. It looks amazing, I had tried hairpiece before, it is extremely difficult to blend in your own hair with the fake hair, Dr. Umar made this one look perfect. It will be a challenge though trying to maintain this perfect look all the time, the slightest imperfections will expose the fact that you are wearing a piece. This result is excellent and I feel quite sure that Praying’s life is much easier and less stressful with his hairpiece maintenance program. I lived with one for almost 14 years and it is very time consuming. As Ixan stated the frontal portion of a hairpiece is by far the most difficult to try and maintain/blend and maintain a sense of natural look without detection.I know with this redesign of his temples/hairline his maintenance program is much less intense than before. I think the goal for anyone seeking answers to their hair loss whether it be hairpiece /transplant or a combination of each as in this case -is to simply live life with less stress, gain confidence and simply feel better about yourself . We are all out for the same goal. Everyone has their own expectations as to what meets their goal I’m just really glad to see that Praying was able to find a solution to helping him be his best. 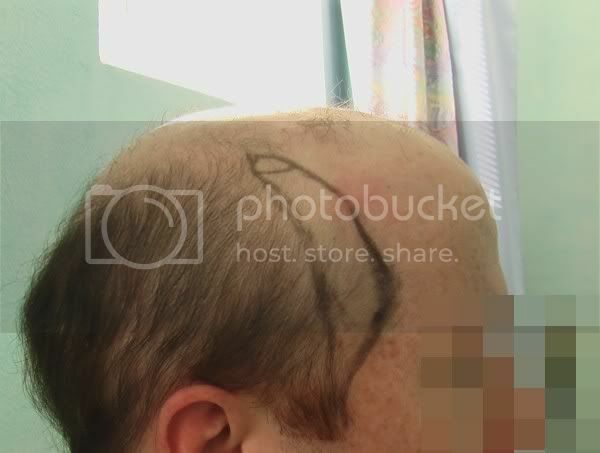 I never thought a hairpiece would look this good, what an interesting idea combining hair transplant with hairpiece, he probably saves a lot of money too without going all the way with a hair transplant. Yeh, that struck me as kind of strange and eerie. Everybody complimenting without having a clue as to how many grafts were used- nor was it asked once. Why post results without ANY INFORMATION. I’m not fond of this result. The beard/neck was extremely unclear as to how it looked post transplant. It’s hard to tell from a few feet away and when the camera is getting closer the slide changes to another picture. I’d ask dr umar a few questions, but as many of my questions in the past were ignored, I’d refrain from doing so again. 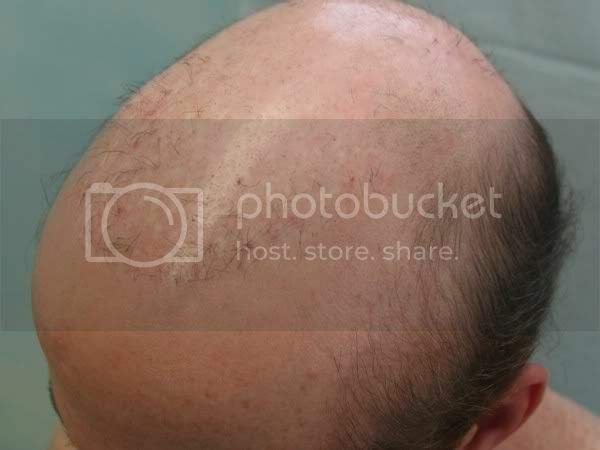 I have seen better hairline results with photos. To those same people here crying about “wheres the video!! !” on other threads, my question to you is “here is a video, but where’s the clarity? close up of hairline”? » » evasive with the # of grafts? » once. Why post results without ANY INFORMATION. » ignored, I’d refrain from doing so again. » is “here is a video, but where’s the clarity? close up of hairline”? Dr. Umar is highly ethical and works harder than anyone. I wouldn’t answer a question you asked either. I don’t like the tone of your posts. At least poke around the internet a little before “lobbing bombs” prematurely. The number of grafts is posted on Dr. Umar’s website and YouTube channel in the patient’s own words. What’s “strange and eerie” (at best) is the butcher who decimated this patient’s donor area. This is amazing repair work using no head hair whatsoever. Forget the hairpiece for a second and focus in this patients “traditional” donor area now compared to where he was before. "I had assumed that I was alost cause. I had given up any hope that my situation could be fixed. About fourteen years ago, starting at the age of nineteen, I underwenta series of hair transplants. This was the early 1990s, and at thetime, many surgeons were still using the large punch grafts—the onesthat produced what is known as the corn row effect. The results werehorrible. I found myself, now in my early twenties, with a disfiguredscalp that could be spotted from fifty yards away. It was the darkestperiod of my life. Anger, shame, and guilt—all of these emotionsdominated my thoughts. In order for me to re-connect with society, i.e., go to college,hold a job, attend family functions, etc., I realized that I had towear a hairpiece. There was no other choice for me. I bit theproverbial bullet and began having hair glued tomy scalp on a monthlybasis. While this did not solve my problem, it did go a small way inallowing me to do some of the things previously mentioned, albe it witha constant undercurrent of anxiety. About four years ago, I became aware of body hair transplantationBHT. Since I had a moderate amount of body hair, and had no scalp donorhair left—I followed with interest. I was skeptical at the beginning.However, over time, I observed that BHT was working for many people.Most of these people were in a similar situation to mine—basically nohope; in fact, some of these patients had been told that they werebeyond repair. It soon became apparent to me that there were only aselect few doctors in the world who were truly committed to theadvancement of BHT as a true alternative for people such as myself. DrUmar was among that small group. I spoke with some of his patients. Ifollowed his work on the Internet. He had built a strong reputation ina relatively short time. To make a long story short, I booked anappointment with him. For the first time in many years, I had hope. As of this writing, it has been about seven months since my firstprocedure with Dr Umar. In total, I have received approximately 4800grafts. Growth became apparent after the four-month mark—much to mydelight. The procedure itself was not painful, and the healing has beenremarkable. I will be able to face this coming summer shirtless, asthere will be no visible signs of surgery. Most importantly, I knowthis: body hair works! Now, I still have a long way to go mind you. 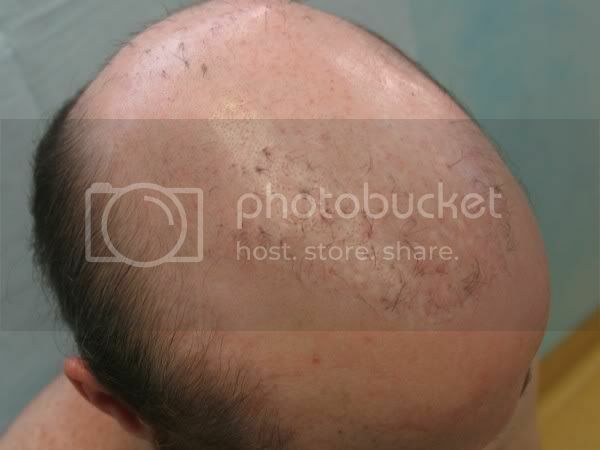 Mybaldness is extensive and will require more sessions to accomplishtotal restoration. That is OK. I take comfort in knowing that Imheaded in the right direction. That alone allows me to face the futurewith more confidence and apositive outlook. I am grateful that I wasable to cross paths with Dr Umar. He is a surgeon blessed with the rarecombination of technical skill, artistry, and integrity. This patient must be very grateful. how many grafts he needs to get rid of hairpiece? just a crazy question. You must be talking about me, I think the video is very well done and it shows in good detail the quality of the work. You are probably the only one I know who has a problem seeing video results. » how many grafts he needs to get rid of hairpiece? just a crazy question. Thousands, and thousands, and thousands, and thousands, and thousands, and thousands, and thousands, and thousands, and thousands, and thousands, and thousands. Oh, my bad. If you go to some clinics that post their photos on this forum you could probably completely restore this case with, say uh, like 3500 grafts. Really, I’m serious, just ask them.